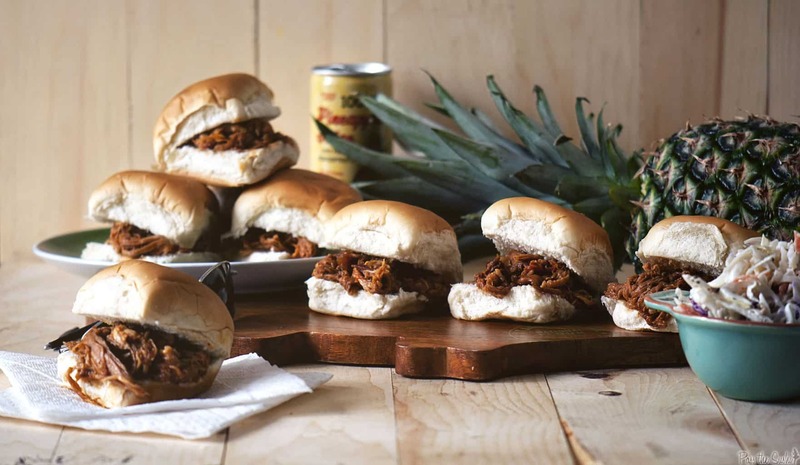 Say Aloha to this Hawaiian Pulled Pork Sandwich! Enjoy the aroma of pineapple and teriyaki as this pork shoulder cooks all day. Lets all say Aloha! Have your own luau with hula stirts and flower leis while you gather the family around the supper table. Tonights “set it and forget it” dinner is inspired by the flavors of Hawaii and my favorite Disney movie, Lilo and Stitch. Mom and Dad can tuck away some hidden flavor of pineapple and teriyaki while this pork shoulder slow cooks all day and is fork tender and ready to shred just in time for a little family moment. After all, that’s what this is all about! Ohana. I was probably too old to have the obsession with Lilo and Stitch that I did, but something about that movie connected with me right away. Lilo is quarky in all the right ways and the moment Stitch says he’s lost, I lost it. You can probably catch me quoting some of my favorite lines on any given day and often sneaking a watch when I know no one else will be home. I served this with a pineapple spiked cole slaw. Leftover pork makes fantastic quesadillas or is an added bonus mixed in leftover macaroni and cheese. 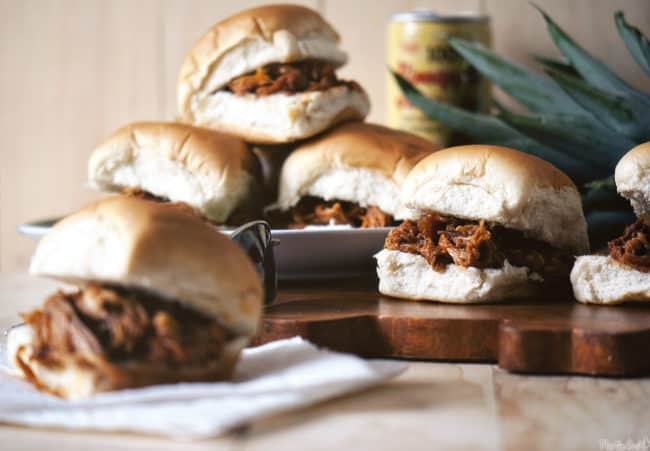 If you’ve tried my Hawaiian Pulled Pork recipe or any other recipe on passthesushi.com please don’t forget to rate the recipe and let me know where you found it in the comments below, I love hearing from you! You can also follow along for more good eats and travel tips on Instagram @passthesushi & @girlcarnivore, Twitter & Facebook. Sprinkle the pork with salt, pepper, and paprika. In a bowl whisk together the teriyaki, chicken broth, brown sugar, soy sauce, chili sauce and pineapple juice. Set aside. Put the chopped onions and carrots in a 5-quart slow cooker. Place the pork on top of the carrots and onions and pour half of the pineapple juice mixture over pork. Reserve remainder for Hawaiian sauce. Cover and cook on low for 7 to 8 hours until the pork is easily shred with a fork. Heat the oil over medium heat in a medium saucepan. Add garlic and ginger and saute until soft, about 2 minutes. Add the remaining pineapple juice mixture, bring to a boil, then reduce heat and simmer for 10 minutes. Remove from heat and set aside. 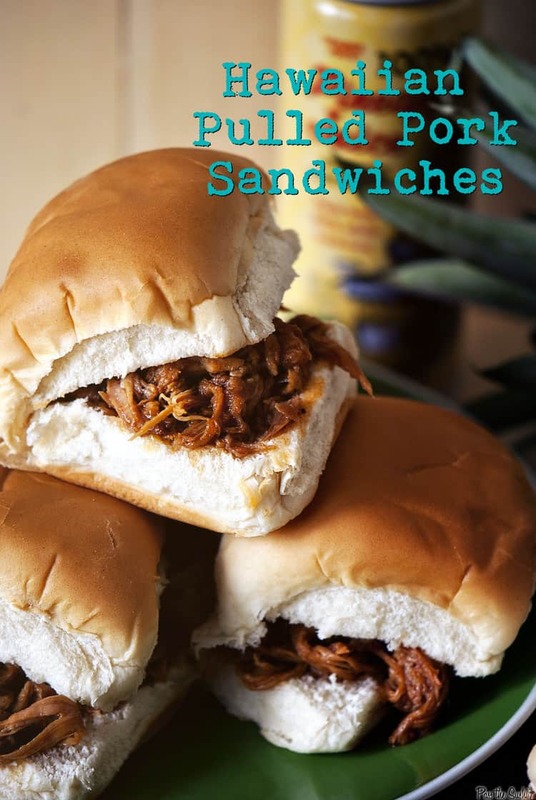 Serve the shredded pork on rolls drizzled with the Hawaiian sauce or on the side for dipping. Got a soft spot for Stitch (told you I watched all the movies!!) as I do for great pulled pork sandwiches! Great looking sandwiches. Love the sweet from the pineapple in there! Pineapple juice in pulled pork!! Yummmyyyyyyyy…. I just adore the flavors in this recipe! Thank you, Kita! I love this version … using pineapple juice. I can just imagine the flavors already! Oh, hehe, I still watch Lilo & Stitch even at my age. I used regular old Heinz, though I did think long and hard on using an Asian. I just figured for the amount used, my mouth would be on fire if I used a Rooster sauce. I want to try this but with brisket instead! Oooo, I LOVE Lilo & Stitch! Beauty And The Beast is my favorite Disney movie, but Lilo and Nemo are close seconds. The pulled pork looks wonderful! Pineapple goes so well in bbq sauce and I love the addition of the teriyaki sauce in this. Yes please, I love some sweetness to my pork! That looks good! Makes me wish I were near the Rainbow Drive-in! Saw this recipe on G+ and had to let you know that these look really good!!! Looking forward to trying! Honestly, I can’t recall. It made a ton of sliders and I would figure it could feed 8 with sides from loose memory. How do you make this without a slow cooker? Can it be done in a thermal cooker? How? Oven, how? Hi there I am wondering how many servings this feeds. I have a crowd of about 30 people to feed and would love to make this. Please Let me know. Thank you!